While attending Wilfrid Laurier University as a History major Groves began carving and sculpting Canadian native peoples and World War 1 soldiers. After graduation, tracing his family's roots to a Confederate infantry soldier led Randy to the great battlefield in Gettysburg, Pennsylvania. That visit rekindled an interest in that era that has endured for nearly twenty years and has made him one of today's most well respected Civil War artists. His attention to detail and commitment to realism have helped him achieve international recognition. Each of Groves' sculptures is refined by hours of painstaking research through archival sources such as diaries, letters and memoirs in order to gain a feel for the human side of these individuals. Photographs also provide clues as to the proper details of clothing and accoutrements and, whenever possible, original examples are examined to add to the accuracy of each piece. Randy's appreciation and sensitivity for the human element that made up the pages of history is evident in his unique images of the times past and the people who lived in them. His Limited Edition bronze sculptures can be found in private collections in both the United States and Canada as well as numerous galleries in Ontario, Canada, Pennsylvania and South Carolina. 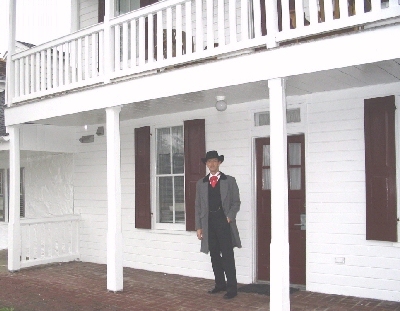 In 1998, Randy was a featured artist at Gettysburg's first annual “History Meets the Arts” festival and has appeared at galleries during this event ever since. In April of 2010 he will again be making appearances at two galleries during this popular venue. Although primarily known as an “historical sculptor”, commissioned work has led him down varied paths. This work includes individuals as diverse as Scottish hero William Wallace, Confederate General Robert E. Lee, and Jerry Garcia of the Grateful Dead. Also in 1998, Groves' travels led him to Charleston, South Carolina where the beauty of the Carolina Coast led him to begin a series of aquatic sculptures that included Humpback Whales and the giant Manta Ray. In September of 1998, Randy's aquatic pieces were featured in Charleston's “ Around the World ” art exhibition which coincided with the around the world yacht races that set sail from Charleston harbor. In the present century, Randy has begun a series of sculptures depicting the native people of the eastern forests of Ontario and New York State. The first of these, an Iroquois False Face Dancer, was completed and a limited edition cast in bronze in March 2001. Another piece, based on the legend of the "shape-shifters", was be cast in bronze to be introduced at "History Meets the Arts" 2002 in Gettysburg. 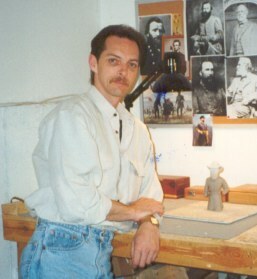 Randy Groves' success in Canada and the United States led to the formation of his company, Southwood Sculpture, in 1994. He and his wife, Deborah, who manages Southwood, reside in beautiful Southern Ontario where home and studio are a short distance from the U.S. border allowing easy access to both countries. It is here they plan for the future…..and relish the past. 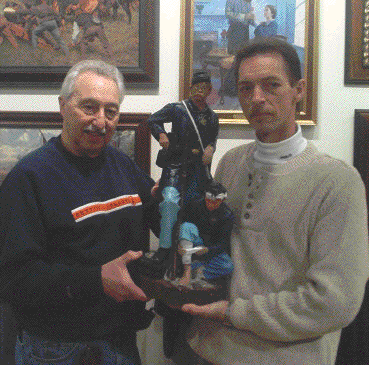 Randy Groves has also done a restoration of a John Rogers sculpture depicting two federal soldiers. Read more about the commission to restore this 1865 work by clicking the image above of Randy Groves with the owner of the piece, Dan DePalma, taken at the Gettysburg Frame Shop & Gallery during the Gettysburg Address commemoration week in November 2002.